← Free or Reduced Apps for your OT mTool Kit! 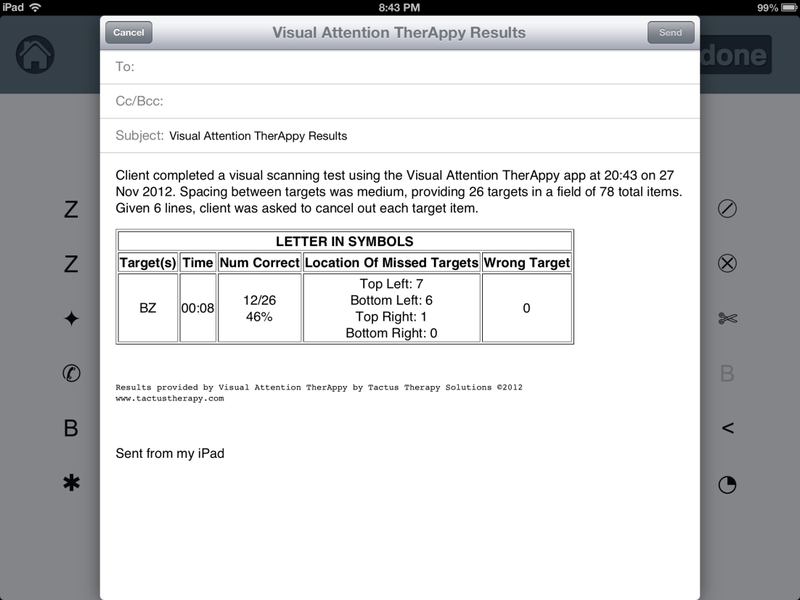 Visual Attention TherAppy ($9.99) , a Tactus Therapy app , is an iPad app designed to help assess and train visual attention in individuals who have difficulty with visual neglect, visual scanning or sustained attention. It is one of the few perceptual apps that I have been able to find that is designed to be age appropriate for adults, as well as older children. The task involves scanning and tapping on 1 or 2 targets from a screen of symbols or letters. The app will keep track of the errors and omissions. The task can be graded by choosing the number of targets (1 or 2), symbols/letters, number of trials at each level, the number of lines on the screen, spacing between symbols/letters, and use of visual cues. The size of the font cannot be increased. The app has a Test Option and a Practice Option. The Practice Option can be used to train an individual to scan in an organized fashion. The app provides an auditory cue when the individual has tapped on the correct target. If the individual has missed a target, it will make a different auditory cue for error. The app will only let the individual enter a target if it is the correct target in the correct left-to-right sequence. You can also set up the Practice session to have a red/yellow/or flashing bar on the side of the page (left or right) to cue the individual to scan to the edge of the page. The Test Option is similar to the Practice Option exception that it will accept target that are out of sequence (do not need to scan left to right). Both the Test and Practice Options will report the time and accuracy at the end of each level. There is also an option to email more detailed results of the session. The email report includes information on time, number of correct targets, location of missed targets (by quadrants), and the number of wrong targets. Here is a sample report of an individual who has left inattention. When I start using this app with a client with left inattention, I will place the iPad directly in front of the client so the information is located in his/her midline. As the client progresses, I may move the iPad closer to his/her left side, to encourage the client to scan further to the neglected side. I also explore with my clients what types of strategies they use to improve their scores, and how they can try using these strategies in their activities of daily living. I like this app because it provides quick and accurate feedback to my clients, and easily records their progress. The Practice Option provides opportunity for individuals to improve their awareness of their inattention. The app comes with very clear instructions, though most will find the app is intuitive to use. And like all good apps, Visual Attention TherAppy Lite version comes in a free “Lite” version . 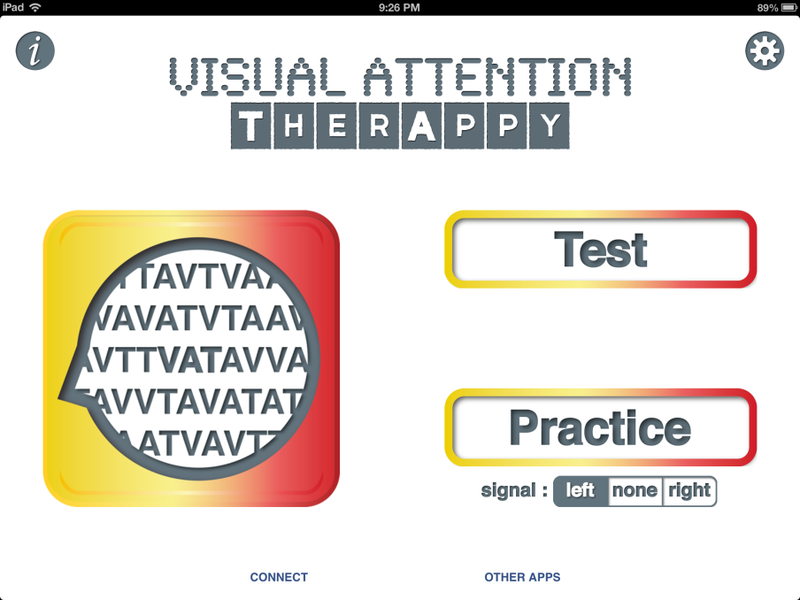 Visual Attention TherAppy is on sale for $4.99 until the end of November, 2012. Adele MacNeill, OT, B.Sc., has 24 years of OT experience in the field of Acquired Brain Injury with adults in B.C. Canada. Her experience includes working in inpatient, outpatient and community settings as well as a consultant to a group home for individuals with acquired brain injury. This entry was posted in App Reviews, Clinic Based Interventions, iPad, Occupational Therapy, Rehabilitation, School Based Interventions, Vision and tagged App Review, iPad, occupational therapy, OT Apps, Vision. Bookmark the permalink. Talk with you very soon! Carol, Do you think that this app would be appropriate for my classroom? (I am thinking of using it with Nic in particular.) thoughts?